The famous "geologic(al) column" that is presented as evidence for uniformitarianism and evolution has several problems. The first one is that the sequences do not exist except in textbooks and the imaginations of Evolution's True Believers ®. The layers are out of order. 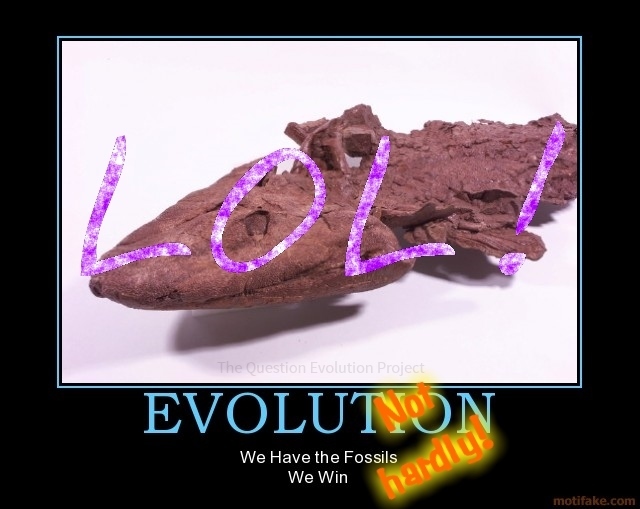 A second problem is the circular reasoning used to date the layers by use of index fossils (we know how old a layer is because of the fossils in it, and we know how old a fossil is because of the layer in which it was found). A further problem for evolutionary geologists and paleontologists are the missing layers, totally disrupting the expected sequences. These are not minor aberrations in small areas that can be dismissed. Instead, they cover large areas and involve alleged millions of years. The frequent flatness add to the annoyance. To make matters worse for uniformitarianism, these gaps support Noachian Flood models postulated by creationists. ‘Flat gaps’, generally known as paraconformities, are contacts within sedimentary sequences where layers of sediment representing many millions of years are said to be missing. Flat gaps are remarkably flat and the sedimentary layers either side of the gap are parallel and relatively thin compared with their enormous geographical extent. Over the alleged long periods of time indicated by the gap, erosion is expected to remove vast depths of sediment and produce a highly irregular land surface. Such evidence of erosion, however, is not found. Flat gaps are common throughout the geologic column and around the world. They are very difficult to explain within the long-age uniformitarian paradigm and severely challenge the concept of millions of years. On the other hand, flat gaps provide strong evidence for a young earth and are easily explained within the paradigm of the global biblical Flood, authenticating the truthfulness of the Bible. Not all gaps in the sedimentary layers are flat, but a significant number are, and these widespread flat gaps pose a serious problem for the long geologic ages. The standard geologic time scale assigns millions to billions of years for the age of various sedimentary rock layers found in the crust of our earth. However, between these layers there are often subtle horizons that are interpreted to represent a break in the sequence of strata where sediments representing millions of years of deposition are absent. These subtle gaps severely conflict with the millions of years proposed by most geologists for the slow deposition of the sedimentary record. Rather, they suggest that the sedimentary layers formed rapidly as would be expected by deposition during the worldwide biblical Flood. You can rock on over and finish reading "'Flat gaps' in sedimentary rock layers challenge long geologic ages".